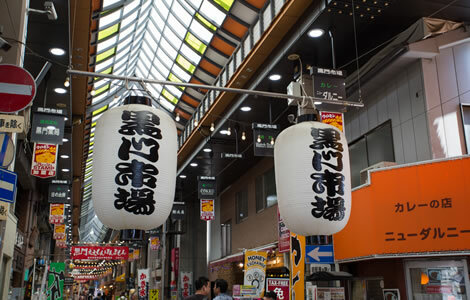 As for Doutonbori,it’s famous for a ｈｕｇｅ and prominent sigh . The sigh is drawn a man . It’s called Guriko. It stands spreading out his hands to look into the Dotonbori River.It was renewed as 6th generation in the fall of 2014. 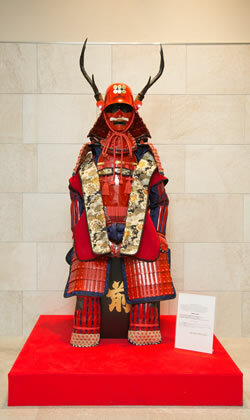 In addition ,it’s aiso famous as “Kuatariro Taro”whocan ring the bell and beat the drum .Please pay a visit with your camera . Then ,A lot of foods such as crab, squid, octopus, cow, are on sale . ① This area is called Minami . Then You can take a picture in foront of 〝Guriko″in the middle of Ebisu Bridge.②The north side of Ebisu-bashi is shinsaibashisuji . the side is popular for those who like elegant clothes. 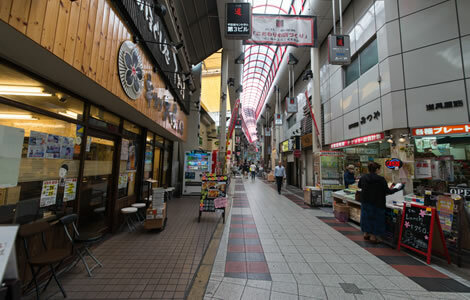 the　south side of Ebisu-basi is Ebisibasisuji　.The　side is popular　for young ladies.then We enjoy shopping　at an affordable price. We are overwhelmed by fresh fish lining up at the shop front. Sometimes We can see a variety of unusual ingredients that are not found in the general market . You shoud go there ! Japanease　often walk and eat . The standard staple of eating is croquette and japaneasecracker. In the Kuromon Market you can eat sashimi and sashimi as well as those. You can only do such experiences in Japan ! 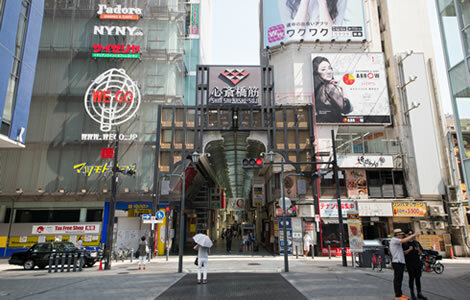 turn around the corner of Nankai Street , go the way between Yoshimoto Kogyo’s Honmaru · Namba Grand Kagetu and kamigataengeisiryoukan. 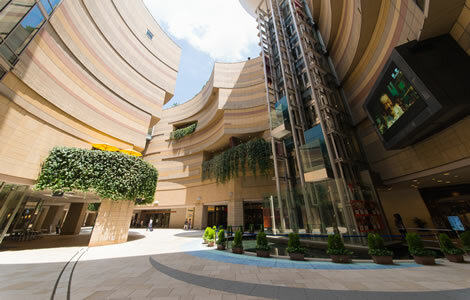 You can arrive Ｓennitimaedouguya-suji shopping area. costumes, and menu samples are divided and we are retailing to the general public, so please stop by all means. 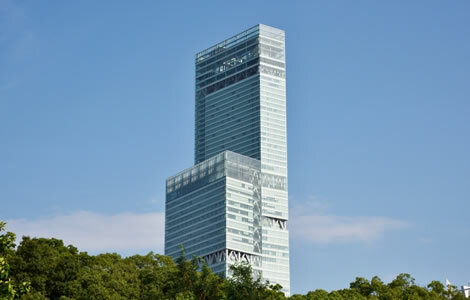 Namba Parks is a complex type commercial facility located in the center of Osaka · Namba. 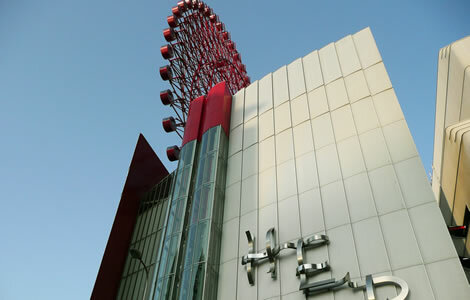 It has restaurants, shopping stores, cafes in cinemas and gyms . You can get all things what you want ! 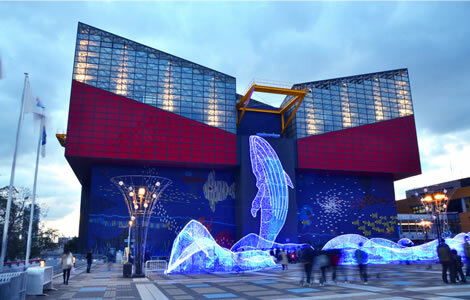 Kaiyukan is one of Japan’s most spectacular aquariums, world-renowned for its innovative presentation. Kaiyukan shows the aquatic animals of the Pacific Rim at their most vibrant and dynamic, by recreating the natural environment of their habitats.a 9 m deep, 34 m long tank containing 5,400 tons of water, serving as the home of whale sharks, the largest fish species in the world.Kaiyukan is confident that the encounter with 30,000 creatures encompassing 620 species—including otters, sea lions, penguins, dolphins,whale sharks, rays, and jellyfish, to name just a few—will prove a deeply rewarding experience. 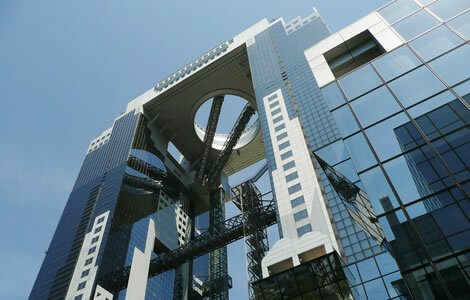 Here it is – HEP FIVE, a landmark of Osaka’s Umeda district.In fact, leave it out, and you haven’t really seen Osaka.The big red Ferris wheel on top makes it one of the city’s most unique integrated spaces.Shop, dine and have fun all in the one space.Try the Ferris wheel after shopping for a spectacular view of Osaka from 106 meters up.HEP FIVE, for some of the best memories of your stay in Japan. Floating Garden Observatory off a dazzling shine at night, the diamond ring as if floating in the sky.Hanging Gardens of the logo, the combination of the motif “key” in the”diamond ring” and happiness crush and sophistication that can not only enjoy here, to express a sense of well-being.Field of view 360 °, in the sky andthe stage to become integrated without unobstructed, to free the mind of the door.The spread in front of the eyes, calm Yodogawa and lush mountains.While feeling the light and wind on the skin,the overwhelmed moments in magnificent scenery.When the sun goes down,the high-rise building neon　south start shine up close. The superb view that has been chosen as the “100 best night view”,to your heart’s content without unobstructed. 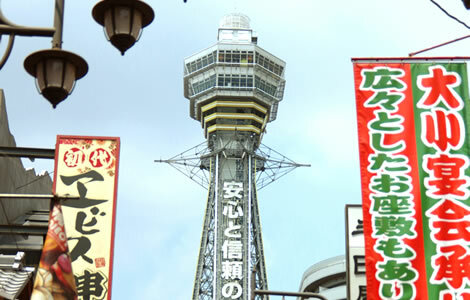 “Tsutenkaku, the symbol of Naniwa” that towers over the　town of Shinsekai, Osaka. Not just the exterior, but every　corner inside the tower has been remodeled. 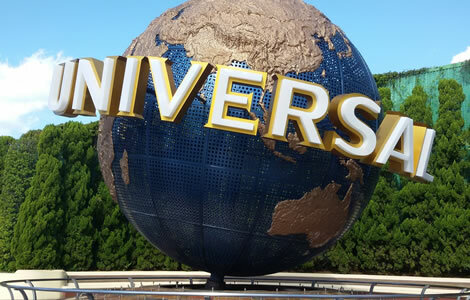 Now it’s the　hottest spot around, offering excitement every day.Enjoy making your way to the top of Tsutenkaku　over and over again, filled with thrills and laughter.